I’ve got super powers. Don’t believe me? Look, I’m levitating! I’m flying without wings! Well, actually, I do have wings… on my sneakers! I first saw this pair of Jeremy Scott sneakers on a magazine and I knew I just had to have them. Don’t you worry. You won’t see me sporting Jeremy Scott sneakers that have stuff toys on them. These are the more “normal” ones out of all his winged sneakers. I just couldn’t resist this pair’s eye-catching print so I made it a point to hunt this pair down when I went to Japan last month. My mom was all, “you better make sure you wear those.” Oh I will, I WILL! I usually take out the wings though whenever I wear them since the wings are detachable. But for this ensemble, I figured the wings kinda match the look I was going for. How come when Asians dress this way, people always label it as K-pop but when non-Asians do it, they call it swag or hip hop? Anyway, K-pop or not, I’m a lover and not a hater so like all other styles, I have an appreciation for it. You know me, open to try new styles all the time. If you haven’t noticed, I’m a little addicted to caps lately. And now I find myself searching for cool sneakers more and more. Don’t worry. I’m not turning hip hop. LOL! I guess I just want more comfortable footwear options for my travels, without sacrificing style of course. Imagine on your lazy days, you can just wear a shirt dress like this or a plain tank and jeans with printed sneaks and a cap, add a jacket to your look and you’re done! Cute as ever! The shoes is so cute, Ms Camille! Love the rose print! but i will only admire this kind of shoes.. i will never buy it cuz i might not wear it! LOL! I guess people label it as K-Pop because they mostly dress like this.. and with the cap? definitely K-Pop! I told you before you would be one legit K-pop singer/band/group! LOL! Haha! I fit in then! LOL! Loved the kicks! I wonder what size are those? Lol. Haha! Great outfit post Ms.Camille! Thanks Rafael! These are 8! Oh my, you almost reached my shoe size which is 9. Hehe, may I know your height Ms. Camille? Haha! You seem like a tall lady! Oh maybe the allowance of your kicks made you levitate on this outfit post. Haha just kidding! Oh You’re taller than me pala, I think I’m just 5’5 1/2 or 5’6. Hehe! EY YO! CAMILLE CO! (hahaha) AS I SAW THIS POST, “THE BADDEST FEMALE” IS PLAYING AT THE BACK OF MY HEAD. (CL OF 2NE1’S SONG) SO FAR I WOULD SAY THAT THIS IS ONE OF MY FAVORITE STYLES OF YOURS THAT I LOVE! ITS JUST SO COOL, RELAX ANDVERY COMFORTABLE TO MOVE WEARING THIS KIND OF STYLE! AND I AGREE WITH YOU… MOST OF THE TIME, THIS IS THE STYLE I ENDED UP ON LAZY DAYS. THE TOP AND THE SNEAKERS GETS ALONG WELL! Haha! ALL CAPS! HOW INTENSE! LOL! :) Thanks Kath! Haha! Damang dama ko! :) LOL! Your outfit is sooo lovely. So . . . . breathtaking. :) Keep it up miss Cams. We all lab you! Very effortless yung pagfly mo! Grabe. I super duper like your whole outfit. Hahaha! Grabe. Iba yung impavt. =)) I want your top! :(( Can I have it? Hahahaha! Mej tumili ako sa outfit, I covet those sneakers haha and also the hat, it’s a shame you bought it from Japan don’t know where I can get plain ones like those here. Anw, go for it Ms. Camille! Hi Camille! :) I just resent my previous email to you in the hope you’d see/read it amidst all those other messages this time! :D I’m really determined to get your attention because I’d REALLY REALLY LOVE to do your nails :) I hope we could have a nail day soon! May it be for an event or just for fun, I’m very much willing to do them! Hey Camille!!! So good to see you in this ensemble! parang its a breather from the almost formal and classy pieces that you wear haha. OH MY GEE! 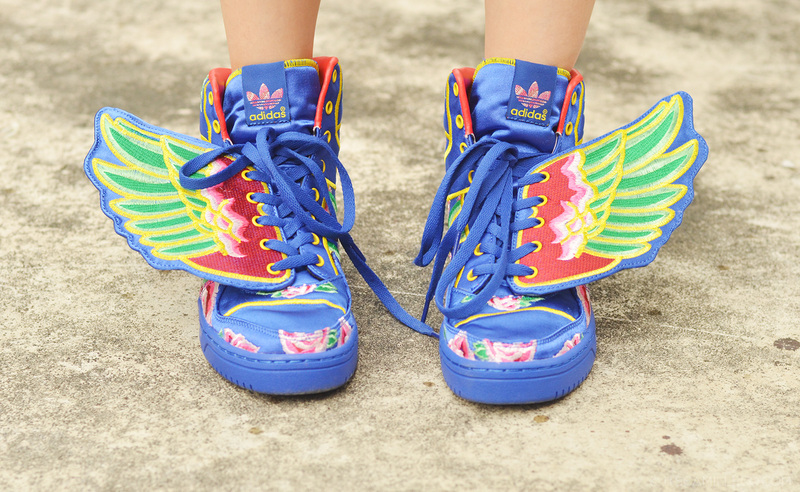 tanong ko san mo nabile yung Jeremy Scott’s mo?! I love them!! i want to give them sa bestfriend ko on her birthday malapit na din kasi hehe. are they available here in manila? how much nyo sya nabili? LOL! Bagets ako! :) Thanks Jane! Love this Ms. Cams!! Now, I can tell my mom that I can wear those kind of shoes more than once. haha! “Look at this outfit post of Ms. Camille.” wahaha! Those wings shoes are sooo adorable! I love this look. It’ so sporty and youthful that it’s just great for the summer! thank you for pointing out how stereotypical some people would be with regards to that “k-pop” and “swag/hip-hop” style! I think this style suits you well (plus that hat addiction of yours, you’re doing it right hahaha.) Beautiful as always, Miss Camille! hi camille! first, amazing ensemble, as always! (established na yan :D) next, what do you think of joanna ladrido and her ask fm account? oh boy, a lot of hate questions pertain to patricia prieto and her family. you’ve been mentioned there like a couple of times too and I get that you are being dragged into their mess. nosy ba masyado? hehe. just curious on your take about this whole hullabaloo :) thanks for answering! its cute. and your look doesn’t look like KPOP. LOL! Fashion hero! Super Camille! Thank you so much for always replying to each comment. It’s really respectable to see how you connect with your readers so effortless. I have been following you for some time now and I think you are fantastic at what you do and also a beautiful person both inside and out. I am always amazed at how much you care about your readers and the humility you display. Just from your numerous responses I can see that you really do appreciate us and I love you for that! Aww thank you Lavender! I really value my readers. All the blessings I’ve been getting won’t be possible without you. :) And besides, you’re not required to leave comments here but you guys still do so, tirelessly. So it’s the least I can do. Reading comments make me happy! The shoes are AWESOME! I could fly off to Camp Half-Blood with those! I like how you made those shoes the statement piece of your outft by going for monochromatic wear. Kudos to your jump shot! It looks like a great fashion editorial piece. I super love your outfit!!! You matched it perfectly with the outfit! I love your style ! Really inspiring :D and always excited to look at your new posts!! Thank you Cazzy! Haha! Too funky for the office! cute…I love all the outfit. Hip-hop, feminine, k-pop, elegant or whatever other styles there are in the world, you seriously can pull out any outfit Camille. You are awesome. Plain genius! Cool wings. And the prints look so cool. Loving the very cool outfit too. Gorgeous photos! You look fantastic! OH MY!! THIS IS MY STYLE! sort of, wondering where u got that shirt? K-Pop peeps have this undeniable swag that they can make anything look good, no matter how outrageous it may look on anyone else. I think it’s their charisma, lolz! Either way, that’s like my go-to outfit for school nowadays! Especially with the weather! Casual clothes and sneakers for the win! And those shoes are so adorbs. My mom tells me that too, the whole “You better be able to wear that more than once, you hear?” hahaha! I think it’s a lip balm :/ Poor memory! Hahaha! The snob dream! :) LOL! Thanks Jayr! Wow! First photo got me so inggit! How could you do a jump shot looking all clazzzzz?? How?? HOW??!!! Or is that even a jump shot? LOL! LOL! I sang it talaga! First photo should win some Pulitzer Prize!! !